IS Femail : Could a Princess be on the way? Home Femail IS Femail : Could a Princess be on the way? A bookmaker has slashed odds that the Duke and Duchess of Sussex’s baby will be a girl. Meghan, 37, and Prince Harry, 34, are expecting their first child in late April and if a recent flurry of bets is anything to go by, a new princess may be on the way. Betfair has revealed that a girl for the parents-to-be are now odds-on at 1/2 after being a popular choice with punters. ‘Following a significant bet this afternoon we’ve slashed the odds of the Royal baby being a girl from 10/11 to 1/2 , with a boy now out to 6/4,’ said Betfair Spokesperson Katie Baylis. The Duchess of Sussex never lets us down when it comes to chic styling. Last week, she attended an event at Canada House wearing a bespoke green coat and dress by Erdem, based on designs from his AW19 collection, before changing into a completely different outfit for the Commonwealth Day service at Westminster Abbey. Meghan looked ultra chic as always but her latest ensemble (opting for a dress, coat, bag and shoes by Victoria Beckham) has got to be one of our favourites yet. This cream chain print midi is a custom made take on the label’s forthcoming AW19 line and we love the elegant shade and floaty fit. The exact piece isn’t available online and everything featuring that sleek print has nowsold out after being spotted on the royal. Thankfully, if you are as obsessed with the style as we are, you can find more chain print dresses (below) to tempt you from the likes of Boohoo, Unique 21, Alexis and Liu Jo that’ll give you the look without breaking the bank. Meanwhile, Diana – in honour of Harry’s late mother – still remains the 5/1 favourite for the name. 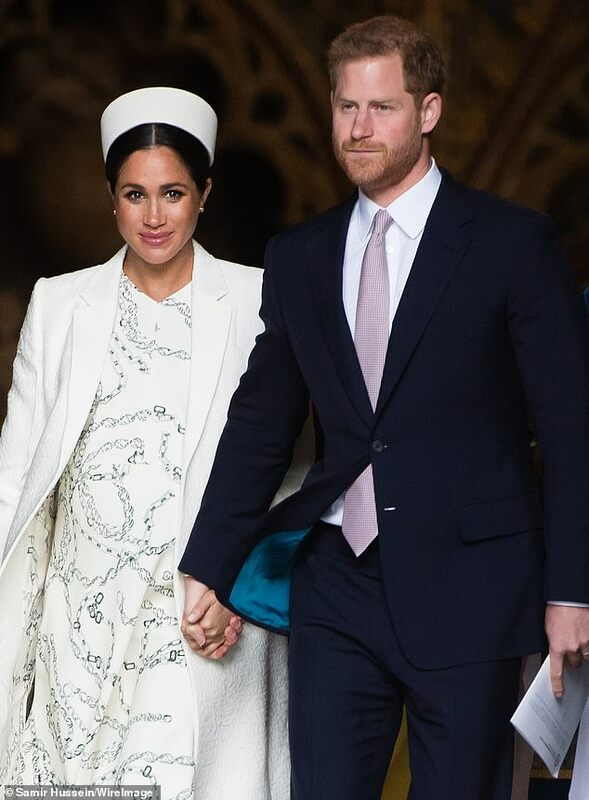 Earlier today another bookmaker slashed odds that the Duke and Duchess of Sussex’s baby will be born on the Queen’s birthday. ‘With Meghan due towards the end of April we could be heading for one of the more memorable Easter Sundays in the royal household,’ explained Coral’s Harry Aitkenhead. ‘Not only would the baby be born on the holiday, it also would then share a birthday with the Queen. Could a Princess be on the way?